Full instrumentation at engine including RPM gauge. Top end rebuild with remanufactured cylinder heads, new valves/springs, new injectors/pumps/yokes/nozzles, rebuilt PTO, rebuilt turbocharger (all work in 2017). Prop reconditioned (2017); Bronze traditional packing gland (new Teflon packing 2016). Electrical system includes 12 volt and 24 volt DC systems and 120 volt AC system. Holding tank: plastic (88 gallons) (new with all new lines and macerator pump in 2017). This is a substantially-built classic wooden charter vessel that is well found for long distance voyaging and living aboard in comfort. The layout features a forward cabin crew’s quarters, three staterooms for guests, a large galley with ample storage, a generous salon and lounge area, and a pilothouse with separate cabin. Enter the forward crew’s quarters through a large deck shuttle companionway. This cabin is set up with a lower double and upper single berth, a settee, a marine head compartment with shower, and ample storage. From the main deck, you may enter the cabin spaces from a port side or cockpit doorway. The aft door opens to a large salon with a settee to port and L-shaped settee to starboard with a large glass table. Teak cabinetry and desks provide for ample storage. Large windows permit splendid views and open for ventilation. Forward from the saloon is the large galley. You will find a three burner propane stove with oven, microwave, a new refrigerator with freezer and a large built-in refrigerator in this space. A very large freezer is below decks for ample food storage. A large opening window complements the galley. Adjoining the galley is the forward lounge area with windows to the outside and teak storage cabinetry. A teak companionway leads below to the sleeping cabins and head compartment. On the lower deck, the master suite is amidships. This features a large queen-sized berth with Tempurpedic mattress (2015), teak hanging lockers and drawers, and a portlight hatch to the outside plus an overhead hatch to the deck. An ensuite head compartment includes a shower compartment with seating and a port light hatch for ventilation. Forward down a hallway a storage compartment to port provides access to the large freezer and storage for cleaning supplies and equipment. Opposite to starboard is the guest head compartment with a large shower and opening port light. The hallway leads forward to the guest cabins. The port side guest cabin features upper single and lower double berths, ample storage in drawers and lockers, and an opening hatch to the foredeck plus opening port light to port. The starboard guest cabin features a lower double and upper single berth, a settee, bookshelf, and teak lockers and drawers for storage. An overhead hatch leads to the foredeck and an opening port light is to starboard. From the main level, a companionway ladder leads to the pilothouse. The helm station provides excellent visibility, with full navigation equipment and ship control systems. A pilot’s cabin with single berth, desk, and storage is aft in the pilothouse. Doors to port and starboard lead to the large upper deck. A companionway ladder at the aft end of this deck leads back to the cockpit. The vessel is equipped with deck gear, accessories, and shore boat appropriate to offshore voyaging and charter work. The vessel is fully equipped with safety equipment as required for charter and offshore passage making. VIRTUAL TOUR - VIDEO - 80 TO 100 PHOTOS - FULL SPECS CAN BE VIEWED OF THIS Malahide Trawler Yacht! Malahide Trawlers were created as long-distance ocean-capable voyaging yachts. These boats conformed to the proven design and construction found in North Sea fishing vessels which sailed in all weather conditions. Malahides were designed by Myles Stapleton and constructed primarily in Norway, Ireland, and Portugal depending on the model. All of the boats had in common: hull construction using heavy timbers, framing, and planking; single engine propulsion with very large engines; extensive tankage for long distance travel; independent power generation capability; and extensive safety systems for offshore voyaging. Our 65’ Malahide Trawler Yacht Pilothouse model is a fine example of the type. The boat has been professionally maintained and actively chartered with a Jones Act Waiver that goes with the ship. All systems and structure are inspected and maintained or upgraded each season. The boat is well-equipped with an approval for up to 12 passengers for hire. As a private yacht, the boat has grace and character with ample accommodations and comfort features. -This vessel is fully equipped for charter service including shore boats, kayaks, and more. Our 65’ Malahide Trawler Yacht is proven as a capable and gracious yacht for long distance cruising and living aboard, as well as having demonstrated multiple years of success in charter service. The condition of the boat today is excellent due to professional maintenance and proactive stewardship. The ability to operate in charter provides financial leverage and an exciting potential to explore distant places with clients. 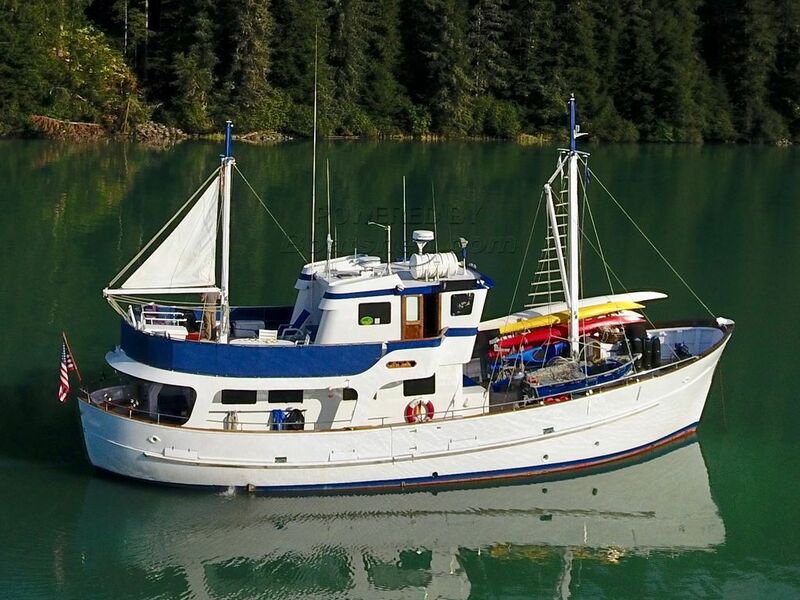 This is a true heritage vessel that offers a compelling lifestyle opportunity for the next owner. Please reach out if you are interested in discovering more about this boat in person. This Malahide Trawler Yacht Pilothouse has been personally photographed and viewed by Brian Moratti of Boatshed Port Townsend. Click here for contact details.